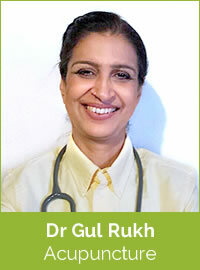 Gul is an experienced medical doctor with a special interest in complementary medicine. Her strong belief in the benefits of a healthy lifestyle and taking a holistic approach to achieving and maintaining the mental and physical well-being of her clients led her to explore natural therapies. Gul graduated with a degree in medicine from the University of Pisa, Italy in 1995. She is a member of the British Medical Acupuncture Society, and she regularly part-takes in further professional development to enhance her knowledge and skills in acupuncture therapies. “Having suddenly become debilitated with ME/CFS since the beginning of 2017, I have been trying everything I can to aid recovery, working with a nutritionist and other specialists. I have been having weekly/fortnightly acupuncture at Irrefutable Health with Dr Gul for a few months, which has been helping. I appreciate Dr Gul’s breadth of experience as a medical doctor as well as her knowledge of functional medicine, nutrition and acupuncture. It is great to have an integrated approach and I have found the sessions beneficial and energising, which is exactly what I needed.